FinalFinish and FinalFinish TMS will correct/improve all three of the above factors. A typical factory barrel will be improved in all three areas, and even hand-lapped barrels need the chamber reamer marks in the throat corrected to perform to their potential. 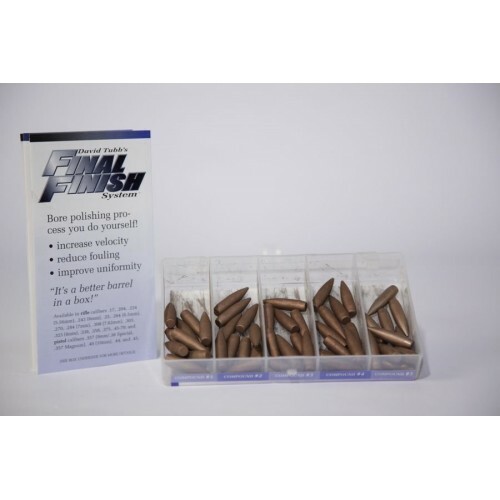 FinalFinish and FinalFinish TMS will remove the most damaging (to the bullet) tool marks, generating a surface finish that goes WITH the bullet instead of against it, and work out "tight spots" that disrupt the bullet. It is okay to use FinalFinish in chrome-lined AR15 barrels. Detailed instructions are included with each kit. "FinalFinish has been one of those products that's a sleeping giant: after word started getting around from people who used it, demand increased tremendously, and that continues. It seems that for every kit we ship we get three or four more new orders from the same zip code..."